Home > Landfill > What Happens to Our Waste? There are approximately 10000 landfill sites within the UK. They vary in size and capacity, and some are privately operated and some are owned and operated by the local Council. Many Council's are now operating landfill sites in partnership with local companies and land owners. Also, sites vary in their designation to handle only household, non-hazardous waste, or have the facility to deal with hazardous waste, from industry.What is clear is that landfill sites have short lives. For example, it is now commonly known that all the existing landfill sites in East Anglia have a maximum 10 years of operation left. 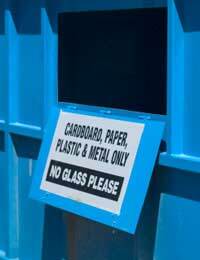 It is agreed by all the operators that the UK is producing more annual waste than predicted, and the current landfill sites are filling up faster. The bottom line is that the country is rapidly running out of land in which to bury all the rubbish we produce. The Government and its agencies have been exporting specific types of waste by sea, chiefly to France and China, but there is mounting pressure against this practice. Viridor Waste Management company operate a large landfill site near Dunbar, on Scotland's east coast. The company is happy for groups to visit and tour the site, and this is highly recommended to get an insight into waste management in the UK. This site takes at least 150,000 ton of waste annually. It is well-served by rail from Edinburgh, the nearest large City. Every morning, a special train arrives bearing rubbish from the city collected the night before. As well as dealing with waste, this site has been at the forefront of recycling rubber tyres by cutting them into chips, and passing them on for further processing. What is a Landfill Site? This site consists of a carefully constructed area, containing a special lining and covering systems to contain the waste. The storage spaces are known as cells, and they are bottomed with layers of clay, sand, and then soil. Clay has traditionally been used as a liner, but due to its inclination to crack or fracture, it is now used in combination with materials such as HDPE or PVC plastics. Unfortunately, despite the best efforts to create effective liners, studies have shown that a 10 acre landfill site will leak between 0.2 and 10 gallons of liquids a day through the plastic liner. Some household chemicals found in regular waste, such as alcohol and vinegar, can actually degrade HDPE. Every day, about 500 tons of rubbish arrives at Dunbar. A JCB compacts the waste, and tips it into the designated cell being filled that day. At the end of each day, the cell is covered with a thick layer of soil. When the cell is full, the final capping layer is put on. This consists of the plastic layer, more soil, a protective geotextile blanket, and a layer of sand. A final soil layer is put on this, which is then planted with vegetation, usually grass. In each cell, once these layers have been put on, there is little oxygen and moisture, so decomposition occurs extremely slowly. Bacteria inside each cell breaks down some of the substances to create both a gas and a leachate, which both need to be controlled. The gas has to be vented out of each cell and carefully handled. At Dunbar the gas is methane, which is burnt on site. The leachate is collected in pipes and pumped up to the surface. It is then recirculated, which has the effect of decreasing its volume, but this also increases the concentration of contaminates within it. This is one way to deal with all the rubbish produced in the UK on a daily basis.However, there are reports that a landfill site was excavated 40 years after being covered and closed, and after this time not even the newspapers amongst the rubbish had decomposed! More serious reports recently found that babies born near to landfill sites were being born with a higher incidence of minor defects. It is still unclear exactly what is causing this, but it is thought to be related to the leachates impacting the local water supply. All this should be enough to encourage much more intensive efforts both to recycle, and to finding other ways to deal with our mounting rubbish. It is truly an environmental and human problem, and one which we need to find solutions for, urgently.